Who Needs a Pension When You Have Real Estate Investments? Everyone and their brother watches a few episodes of a home renovation show and wants to flip houses and buy rental properties, thinking they can do it in their “spare time.” Newsflash: it’s a lot harder than it sounds, and thousands of wannabe real estate investors have lost their shirts because they go about investing the wrong way. This is your chance to learn how to invest in real estate, purchase rental properties, and flip houses for investment income the right way. Take it from us – we’ve been doing it for 10 years and have multiple passive income investment properties – all on our own middle-class salaries, without trust funds or lottery money or whatever crazy finances you might think you need to be a successful real estate investor. At this master class, you’ll learn from our years of experience on what it takes to invest in real estate. We strongly believe that real estate is a pension plan for small business owners. Entrepreneurs like you don’t get a pension plan – and you don’t want to work till you’re 80, either. 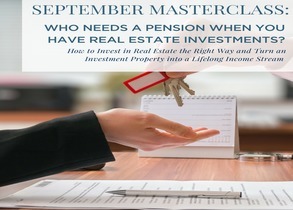 We’ll show you how even one investment property can become your pension in fewer than twenty years. We’ve been in and out of hundreds of homes over the years – we’ll show you exactly what we look for when deciding to invest or not. You’ll walk away with the tools you need to start investing in income properties and setting yourself up for life – no trust fund required.